A few weeks ago Clicks had a huge sale on a few beauty items. One of the things I picked up in this sale was the Sally Hansen Gem Crush polishes. I have also seen tons of other people pick these up as well. For some reason I have either never really seen them before or they didn’t appeal to me. I don’t know why though because they really are so pretty! I managed to find 3 in the frenzy at the sale. I almost had a fourth shade but it was whipped out of my hands before I could even get a good look at it. It was crazy I tell you!! Anyway, on to the pictures! 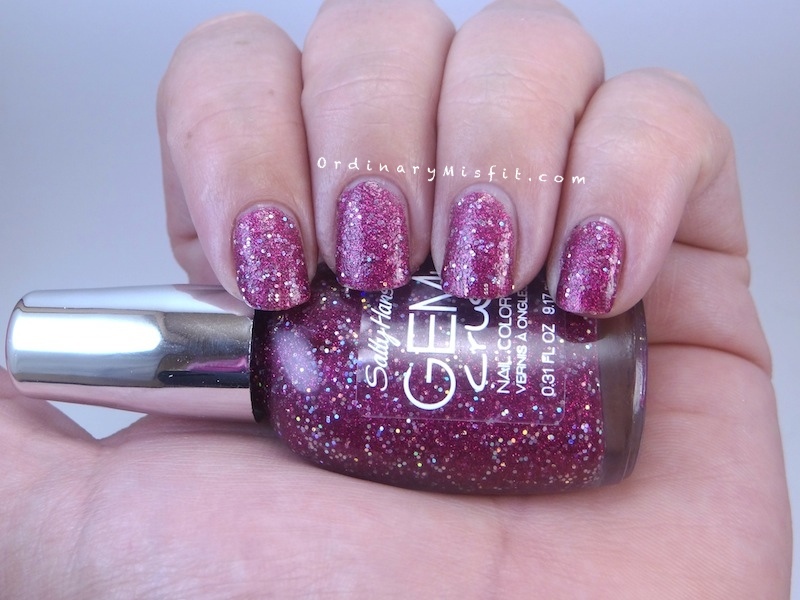 Lady Luck is a fuschia colour base packed with fuschia colour glitter and some silver holographic glitter. I am wearing two coats with no topcoat. In just two coats it was completely opaque. It did have a texture feel to it but after a coat of two of topcoat it will be smooth and even more shiny. I absolutely love this colour and application was really quite easy. I love that it is opaque in two coats. This is really eye catching! 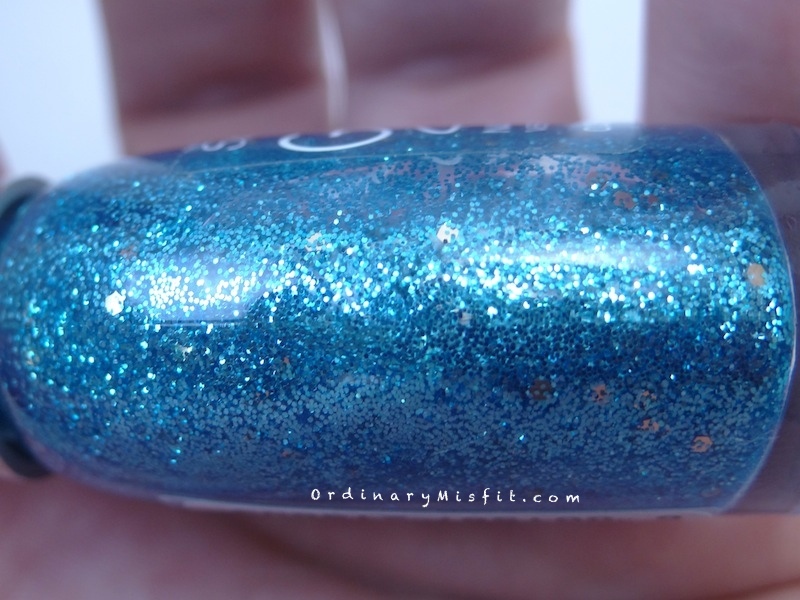 Blingtastic is a clear base packed with aqua blue and silver glitter. In the photos above I am wearing two coats with no topcoat. It is mostly opaque but if I look closely I can see a few bald spots. Nothing a third coat or undies couldn’t fix. This is super sparkly and bright. I actually tested it on my nails while wearing a bright pink and it looked amazing! The brush wasn’t as nice on this one as it was on Lady Luck but still fairly easy to work with. Big money. I don’t even know what colour this is. There seem to be gold and silver bigger glitter but also a rose gold tinged colour in there. There is also tons of fine micro glitter in the clear base which is why it is opaque in the two coats I am wearing here. No topcoat. I love this one. Big Money is gorgeous and will work with pretty much any colour you want to pair with it. I picked all three of these up at Clicks for R39 each and I believe they will stay at that price for as long s stock lasts. Don’t quote me on that though, it’s just what I hear. They are also selling out really fast so if you like what you see I would suggest you go look for them sooner rather than later. Do you like these? 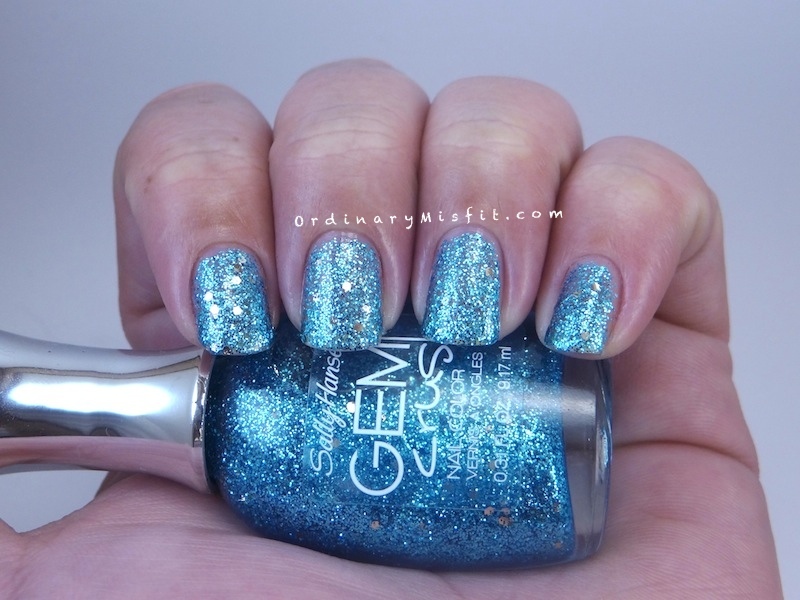 Are you a fan of glitter packed polishes? I never used to like glitter but lately I seem to be very drawn to them. These don’t help 😉 I can’t believe it’s weekend already and we are in August! Where is the time going? I hope you have a fabulous weekend! I am in love with Big Money wow! That blue is so bright an sparkly! I would stare at my pretty nails the whole day! Hahahaha I know exactly what you mean. I wore it for much longer than I intended to because of how bright and sparkly it was. Couldn’t stop staring! Thank you! I have the dark pinkish purple one as well and the lighter purple I had on my blog this past week. I really love them! As always, a beautiful post! I like the gold, then blingtastic. Lady luck is pretty but doesn’t stand out as much (for me) as the other two. The Big Money one is my fave! 😀 I want the blue one but couldn’t find it anywhere 🙁 Now I’m sad that it’s sold out at Clicks! Oh no, how sad. I am so lucky I spotted these when I did. They are so gorgeous! I didn’t think I would but out of the bunch I like Big Money the most! And I had it in my hands at the store! It screamed out “Buy me! Love me” and I left it behind! 🙁 It is gorgeous! Oh no!!! I hate when that happens. I went into Clicks the other day here and they had quite a few of them. You might still find it? You literally had polish taken out of your hand??? That is crazy!!! I’ve seen these around in all our drug stores, but have never gone for them. I do like Big Money, though…it’s kind of unusual. I know. It’s actually a bit revolting. I know they were on sale and everything but come on!! I have seen these a few times before but they’re not really my ‘thing’, untill I tried them. Definitely a favourite.